It's only silence because I'm not doing a Cabinet of Curiosities story this month--we're lightening up our schedule a bit so that we take two-at-a-time alternate months off. Look for some appropriate spookiness from Emma and Claire though. It's not even really October here, because it's in the 90s all week (miserable pout, why do I live here, etc). Autumn's my favorite season and we get horribly little of it here, and mostly in December which feels all wrong. Anyway! But this post is to put here something I've already posted on Tumblr: The artist and photographer Anne Arden McDonald, whom I've never met but whose work I greatly admire, likes Summer and Bird, which is already fairly thrilling. But also, she also made this gorgeous cover for the book to give to her nieces. So . . . worth mentioning on every social media outlet? I say YES. Check out her work if you're not familiar. My niece Emma recently re-read Summer and Bird and made some art in response to it. Honestly if there is a better writing-related happiness than someone making something as a response to something you made, I don't know what it is. Her beautiful version of the lovely back cover of the book. This other one is a drawing of the inside of the red house, which is one of my favorite parts of the book. She even got the vines on the wall. HAPPINESS. and the gray rag rug! SIgh. Okay, in other news. We Cabinet curators celebrated publication day with the #sharescary hashtag on Twitter--heard many fears and many creepy stories, and prizes are now flying out all over the world to participants. Two of mine are postcards with a custom scary story. Yeah NOW you wish you'd played. There is also an ongoing giveaway at Cynthia Letich Smith's Cynsations blog -- get one chance to win a copy of the Cabinet of Curiosities just by commenting, or get four chances by leaving a 100-word scary story written to the prompt "visitors." That post also includes a really first class photo of my cat Adam, looking appalled, and one of Stefan reclined upon candy. Contest ends Sunday June 8! Finally and perhaps most gloriously: we're doing a Cabinet of Curiosities podcast every week this month. The first episode is Claire Legrand reading her marvelous story "The Tin Man's Price"--you can listen to or download it here. Or subscribe to the podcast in iTunes. Stefan Bachmann composed eerie and splendid music for this thing, so you MUST give it a listen. That's it I think! Thanks all, and thanks, Emma. Wow I just realized that dolls with teeth are becoming a theme in my work. Artistic exhaustion, or secret obsession? I am actually NOT one of those people easily disturbed by dolls, but there are a lot of you out there, and every single one of you should go read my new Cabinet story. Now! Hurry, hurry! The people who aren't all that freaked out by dolls are politely letting you go first, but they look impatient to me. I forgot to note where I stole this awesome image from. It was a review of this doll. My apologies, doll reviewer! In other news, The Cabinet of Curiosities: 36 Tales Brief and Sinister will be released this Tuesday, May 27. We the Curators are all kinds of psyched, and have various guest blogging and twitter hashtaggery planned to celebrate--oh and a podcast, yes you heard me. More as it happens! Meanwhile, though, Greenwillow is running a great Cabeinet-themed contest on its blog --here's the latest, but I think they post a new one today and another next week. Cannot believe I forgot to post here about on of my favorite Cabinet stories I've written in a while, plus some happy news. The Cabinet story is called "Ariel" (which is a tiny private . . . not joke, exactly: what do you call a private joke that's serious?). 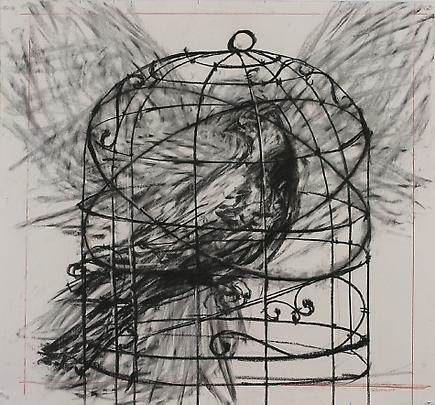 Our theme is birds this month, and I'd recently been obsessively web-stalking the artist William Kentridge, so my story was inspired by one of his drawings for a production design for The Magic Flute. So that. But then the happy star is that The Curiosity Cabinet--which began as this crazy little web-project, just for fun--besides now having a pretty glorious jacket and illustrations (Greenwillow did a gorgeous job with the package), also has a Kirkus star. Six hundred hurrays to THAT. To celebrate publication, we've got a lot going on, including a 36-day countdown in which we tweet a line from one of the stories each day, do several giveaways, and more stuff currently top secret. Stefan Bachmann is doing a quite splendid world giveaway right now, so if you're interested in winning all kinds of books, check that out. Book comes out May 27, 2014, in hardback and paperback, so just GET READY. Not today so much, but a couple of days ago, when I wrote my latest Cabinet story, it was crazy windy--a speaking wind, you know, the kind that mutters and howls and woooos. And our Cabinet theme for March is wind (I know, original right?). IT WAS A SIGN. My story is a perversion of that strange and lovely George Macdonald classic, At the Back of the North Wind. As a child I read that book over and over. I wanted more books like that, dense and rich and not always fully parseable, at least to me as a child. Not everyone feels that way of course, as a child or an adult. I wonder if that longing for the unparseable, for gorgeous spots of opacity and ambiguity, is inherent or learned or what. Either way, I'm always so glad when I find someone else who feels the way I do. Secret Society of Negative Capability y'all! This week's Cabinet story is PLENTY parseable and straightforward, believe me. Poor Ruby, adopted as the new Diamond by a North Wind driven mad by loss. That's not gonna end well.